Prominent & Leading Exporter from Anand, we offer cc 600 fabricated conveyor chain. 63.50 mm Pitch Conveyor Chains for LPG Bottling Plants. This Chain comes with lot of variants as suitable for plants, consultants and maintenance contracts. 63.50 mm Pitch Conveyor chain is also know as CC 600 Fabricated Version of Malleable Chain. This Chain also is used in Barrel Manufacturing Industry and Processing industry. 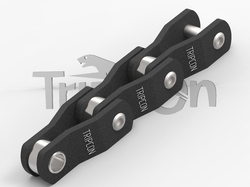 Tripcon Manufactures this chains for domestic market as well as International Market. Looking for LPG Conveyor Chain ?